The history of Kings Cottage is intimately connected with that of an associated butcher shop, since demolished, but which originally stood in front of the cottage facing Dayboro Road. Although the early history of both buildings remains obscure, the available evidence suggests that they were constructed during the late 1880s. 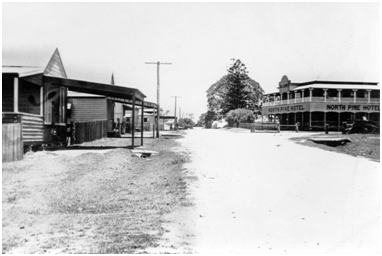 It is well-known, however, that the buildings were moved to the present Dayboro Road site in 1936, as a consequence of the opening of a new North Pine Bridge and the creation of a new road connecting the bridge with Anzac Avenue in the vicinity of today’s Petrie roundabout. This was a dramatic change which caused the demolition or removal of a number of buildings and which completely changed the geography of the small township of Petrie. The shop originally faced Redcliffe Road in the vicinity of the roundabout (Resubs. 7-9 of Sub. 2, Portion 28, Parish of Redcliffe). Behind it was the cottage (Resubs. 45-46) accessible from the shop or via a laneway between the general store (Resubs. 3-5) and William Reid’s shop (Resub. 6). Although Sub. 2 (57 acres, 3 roods, 38 perches) was purchased by the well-known North Pine pioneer, Alexander Jackson Wyllie (1854-1934) on 18 April 1883 predominantly for farming purposes, he almost immediately set about subdividing the northern section adjoining Redcliffe Road to facilitate the growth of the township. Incomplete records and delays with land transfers during the late 19th century have rendered the details of land tenure in this area very unclear, but it is certain that Wyllie was leasing some of these allotments to prospective buyers only a year or two after he moved into the district. On 30 November 1895, Resubs. 7-9 and 45-46 were transferred to Hugh O’Loan (1838-1914), the Sergeant of Police who was stationed at North Pine from 1879 to 1890, but whose family continued to reside in the town during the 1890s when he was posted elsewhere. Caboolture Divisional Board valuation and rating records clearly indicate that O’Loan paid rates on the property from at least 28 May 1887, despite the fact that the transfer of Title did not take place until 1895. By the late 1890s, early photographs reveal a continuous array of buildings along Redcliffe Road, including the area occupied by Resubs. 7-9. In common with many other police officers during the 19th century, it is clear that O’Loan and his family were intent upon engaging in additional commercial activities wherever possible. O’Loan’s wife, for example, received a £12 per annum allowance from 1879 to 1884 for providing the town’s postal service, though it is most likely that this was conducted from the police building in the River Reserve. 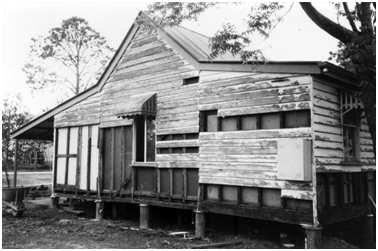 As a number of Petrie senior citizens have clear recollections that the laneway referred to above was known as ‘O’Loan Lane’ during the early years of the 20th century, it is likely that some members of the large O’Loan family lived in the cottage. It should be noted that this original lane was parallel to, but east of, today’s Cooke Street. The O’Loan family retained ownership of Resubs. 7-9 and 45-46 until 11 July 1913. From that date thereafter, the butcher shop and cottage were both owned or leased by a progression of butchers. The first transfer was to Jessie Bain Kruck, whose husband, Christian Ruhen Kruck, is listed only in the 1913/1914 Queensland Post Office Directory as a Petrie butcher. From 1914 to 1927 the property was owned by Alf (Alfred Richard) King and from 1927 to 1930 by John Ribbins Young. During the latter period Jim Ebert rented the cottage and worked in the butcher shop. From the early 1930s, there were a complex series of changes, only some of which are noted here. Although ownership had been transferred to Thomas Lang Hatton in 1930, Pat (James Henry) Ebert rented the cottage for his family and also worked as a butcher for Young. In early 1935, Alf King’s youngest son, Ras (Redvers Joseph) King bought the business from John Ribbins Young and moved into the cottage with his wife Violet and their three sons, Redvers Alfred (later known as young Ras), Eric Edward and Colin Roy. Their daughter, Enid Rose, was later born in the cottage. It was only about 18 months after the Kings bought the business that they were required to buy the land at 18 Dayboro Road and move the buildings to make way for the new road. … mince was six pence a pound, sausages eight pence and all cuts of beef were from six pence through to one shilling and three pence. Mutton, pork and veal were in that same price range. Of course, at that time, two bullocks could be bought for what you can now carry away in a plastic bag and a butcher’s wage was under four pounds. King’s Cottage undergoing renovations, November 1994. The photograph reveals some details of the construction of the building. The central section was a simple ‘Colonial Gable’ style dwelling with a steeply-pitched roof typical of the 1880s and 1890s. Opening of King’s Cottage, 4 March 1995. Members of the King family can be seen in front of the building. When the war ended, Ras King Snr., who had been a P.O.W. of the Japanese, returned and resumed the business, assisted by young Ras, who returned home from working on a cattle station. Only two years later, in 1947, the property was purchased by Landsborough North. The association of the King family with the butcher shop did not end at this time, however, as Colin Roy King, who had begun his apprenticeship with North, took over the lease of the shop from 1975 and ran it until it closed down in 1985. Although the shop continued to stand for a few years, it was eventually knocked down. 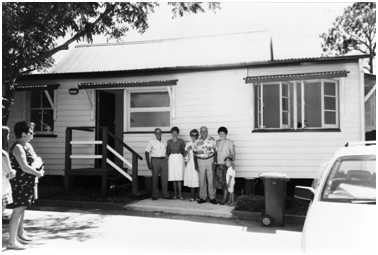 Throughout this period, the cottage remained occupied by a series of tenants In 1992 the Pine Rivers Shire Council acquired the property and continued to rent the cottage for a couple of years before refurbishing the building during late 1994 and early 1995. On 13 December 1994, the Council recommended the name ‘Kings Cottage’ to commemorate the King family’s extensive ownership or association with the building at several different stages of its history. It was officially opened as a Council facility on 4 March 1995. As mentioned previously, William Reid’s shop adjoined the butcher shop at its original location. William Reid (1852-1937) purchased Resub. 6, Portion 28, on 21 June 1886 to set up business as North Pine’s first bootmaker. The 1887 Caboolture Divisional Board Land Valuation confirms the presence of a shop and house on the site. He maintained the business until the coming of the new road in 1936, remaining as the town’s only bootmaker for half a century. He passed away the following year on 26 March. Reflecting the make-up of the early North Pine community, William was related to other well-known Scottish pioneering families such as the Whites and Hays. (His mother was Isabella Hay and his sister, Catherine Reid, was James White’s second wife.) Reid’s shop was one of several buildings demolished or removed prior to the opening of the new road. Other buildings similarly affected included Twible’s Store and Giess’ vacant shop (only used as a store from about 1908 to 1920, but Herman Giess continued to live in the building). The butcher shop can be seen near the centre left of the photograph, partially obscured by Herman Giess’ building. Wallace Young, Anecdotal History of Kings Cottage and Associated Butcher Shop, unpublished manuscript held in the Local History Collection, Moreton Bay Region Libraries, 2003.